I cannot praise the book too highly ... It is a matter of regret that its length has made it impossible for me to "read it from cover to cover" before producing a review. But it is with delight that I look forward to having it occupy a place on my bedside table for many weeks to come. Synesthesia proves that perceptual reality is not one-size-fits-all. For the current state of the science, you won't find a more comprehensive collection of expert voices than the one you're holding now. 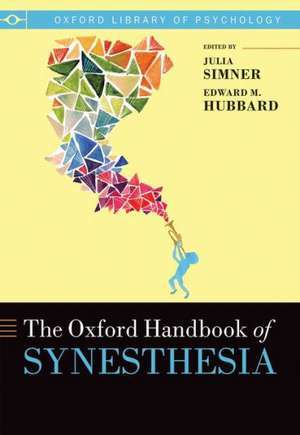 An invaluably lucid and comprehensive guide to the multi-coloured world of synaesthesia by two of the leading researchers in the field. This is a fine reference book for specialists and newcomers to the field. Dr. Julia Simner is an experimental neuropsychologist and leading expert in the field of synaesthesia research. She has a background in psychology, languages and linguistics from the Universities of Oxford, Toronto and Sussex, and she runs the Synaesthesia and Sensory Integration lab at the University of Edinburgh, Scotland. Her work focusses on the sensory, cognitive, linguistic, developmental, and historical bases of synaesthesia, and has been published in highimpact science journals such as Nature, Trends in Cognitive Science and Brain. She is interested in facilitating the public's understanding of science and her work has been reported in over 100 media articles world-wide, including the NY Times, BBC, CBC, Telegraph, Times, New Scientist, ScientificAmerican etc. In 2010 she was recognised as an outstanding European scientist by the European Commission's Atomium Culture Initiative and her science writing has been published in some of Europe's leading national newspapers.Dr. Edward M. Hubbard is an Assistant Professor in the Department of Educational Psychology at the University of Wisconsin-Madison where he directs the Educational Neuroscience Laboratory. He received degrees from UC Berkeley and UC San Diego and completed his post-doctoral training at INSERM's Cognitive Neuroimaging Unit and Vanderbilt University. He has investigated the perceptual and neural bases of grapheme-color synesthesia and synesthetic number forms for more than a decade, and hisbehavioural and neuroimaging work was critical in convincing the scientific community that synaesthesia was a valid, tractable topic for investigation. More recently, he has begun to investigate the neural basis of numerical and mathematical processing in non-synesthetes, and the development of theseabilities in children, to better understand the neural mechanisms that lead to the development of synesthesia in children.